Guest parking is $18 per day with in and out privileges. Our parking is the lowest price in West Hollywood. (See parking garage location map and photos below). 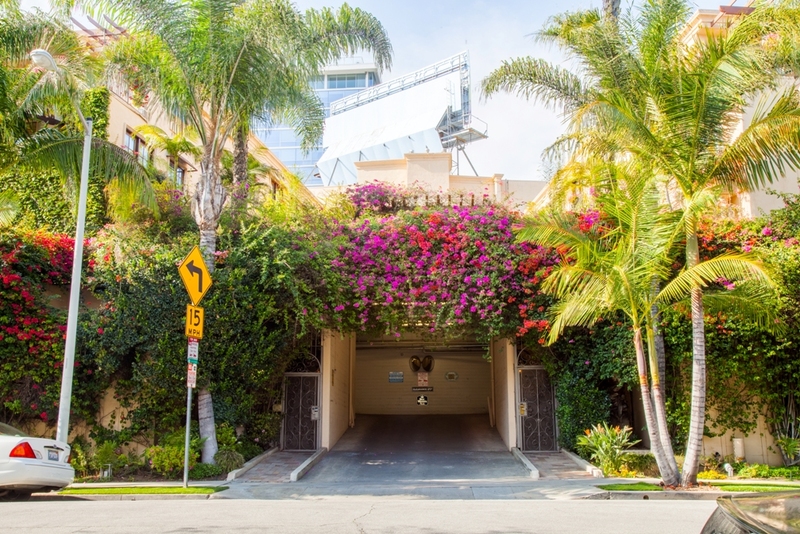 Although our parking garage is located directly under the hotel, the entrance is one block south on De Longpre Ave. To get there from the front of the hotel, drive 1 block east on Sunset Blvd. to North Sweetzer Ave., and then turn right. Head down the hill and make the first right onto De Longpre Ave., and then drive approximately 750 ft. to the parking garage entrance, which is on the north side of the street (right). How far is the hotel from Universal Studios? We are just 5 miles from Universal Studios, and we can arrange transportation. How far is the hotel from Los Angeles International Airport (LAX)? We are 12 miles from LAX, with a driving time of 45 minutes to 1 hour depending on traffic, and we can arrange transportation limo/etc. Do you have a exercise room or gym at the hotel? Yes, we have a gym that is open 24 hours. Yes! We have an outdoor heated pool that is open year round, located in our picturesque Garden Courtyard. Yes! We have a Free Hot Buffet Breakfast 7 days a week from 7:00 - 11:00 AM. Breakfast is served on either the 3rd floor or 4th floor. Do you have a restaurant at your hotel? No, but we have a Free Hot Buffet Breakfast served 7 days a week from 7:00 - 11:00 AM. Plus, there are dozens of restaurants within walking distance that serve lunch and dinner. Yes! We have free, super fast 100Mbps WiFi for our hotel guests to enjoy. Yes, however we can only accommodate service animals. Yes, we have a laundry room with washers and dryers that is open 24 hours. Yes, our front desk is open 24 hours. Do you offer sightseeing tours or activities? Yes, we have several tours that pick up at our hotel. We would be delighted to help you book any tours or activities once you arrive. Tours include; Celebrity Movie Star Homes, Hollywood, Beverly Hills, Beaches, and much more. How easy is it to pick up a taxi from the hotel? We have a taxi stand directly front of the hotel. Yes! The Best Western Rewards® program is one that really gives back, and awarded one of the top hotel loyalty programs.There is no black out days, points will not expired. It pays to join Best Western Rewards®. Yes, room service is provided by Saddle Ranch Restaurant, which is located directly across the street from the hotel.